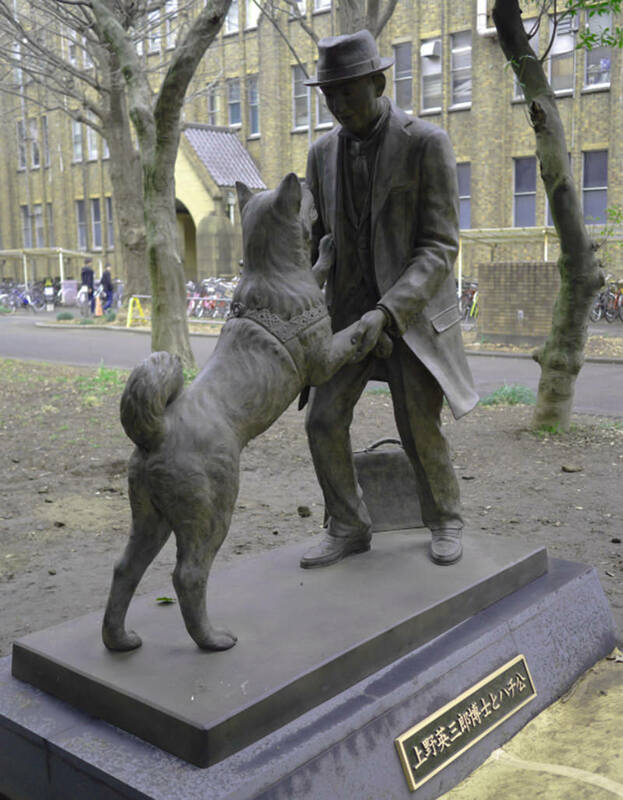 I’ve said it before, and I’ll say it again: dog loving people are the best. They are the kindest, most generous people out there. When you meet someone at some random moment—like while your car is being serviced—and the subject of dogs comes up (because with me it always does), and a big grin appears…you know you’ve found one. Next they reach for their phone (which used to be wallet) to show you a picture of their dog, and usually you get a little story. Well, the same thing happens in the virtual world also. 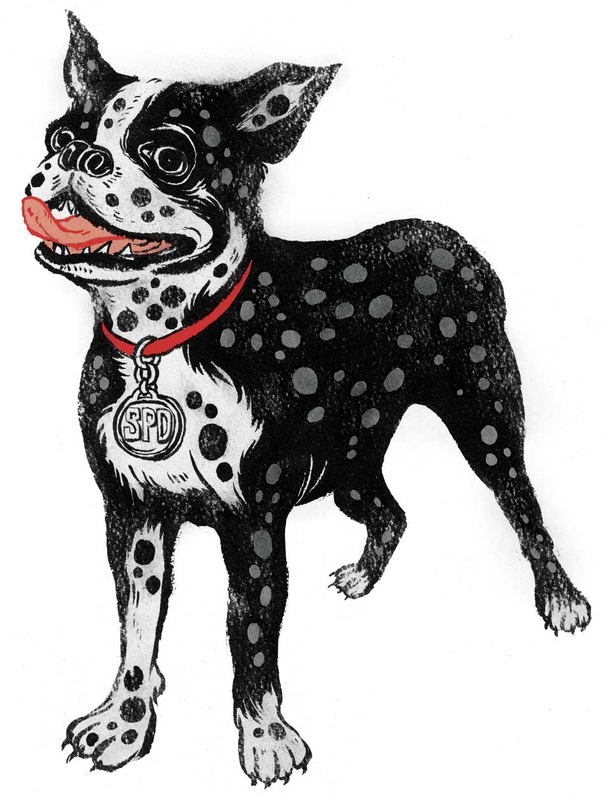 The Boston Terrier illustration above is by the incredibly talented Japanese illustrator Yuko Shimizu (I will quickly point out that she’s NOT the Yuko Shimizu that created Hello Kitty! ), and she created it for a poster a few years ago. The dog belongs to Bon Appetit design director Matthew Lenning, and the poster was for a Society of Publication Designers competition. When I came across this illustration I knew I had to see more. It is some of the most beautiful illustration work I have seen ever, and I find myself mesmerized by it. She must be one of the most sought-after illustrators around because there’s a lot of it to see, her website showcases around 400 pieces! What I love even more is that she traded her dull career in advertising and PR to pursue art, left Japan and came to New York to attend the School of Visual Arts. Since graduating she’s obviously kept herself very busy, and she also teaches at the school. Back to the dogs. When I contacted Yuko, she was happy to be featured on the blog and said she needs to draw more dogs (yay!). We agreed that this illustration, as well as the one below would be good choices. She also made sure to tell me right away that she LOVES dogs, and that her own handsome long haired Chihuahua Bruiser was used as the model for this poster (I didn’t ask if the caped woman is her, but since there are brushes and art supplies in her hair, hmmm). 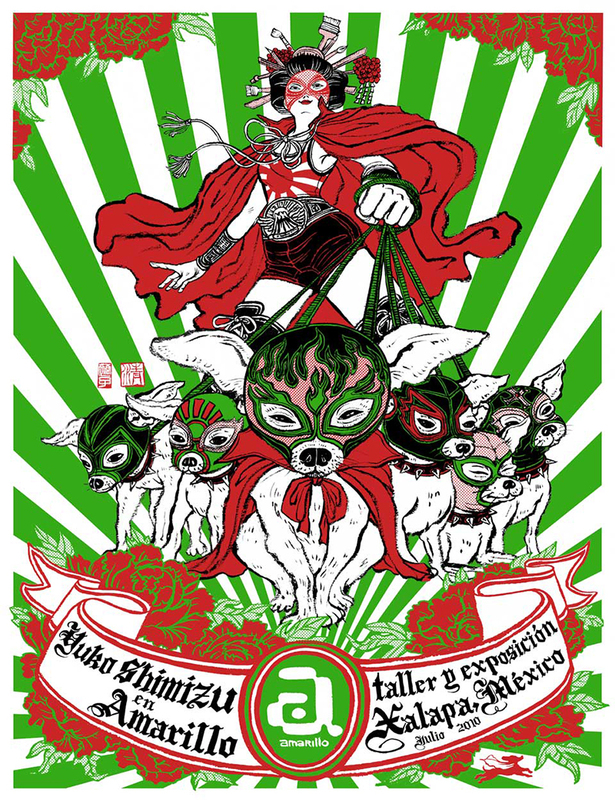 Yuko travels quite a lot for speaking engagements, and this poster was for one in Mexico. If you’d like to become mesmerized yourself, visit Yuko’s website here. Her self-titled monograph was published by Gestalten and can be found here. She’s also creating a children’s book that will be released this year, titled Barbed Wire Baseball. 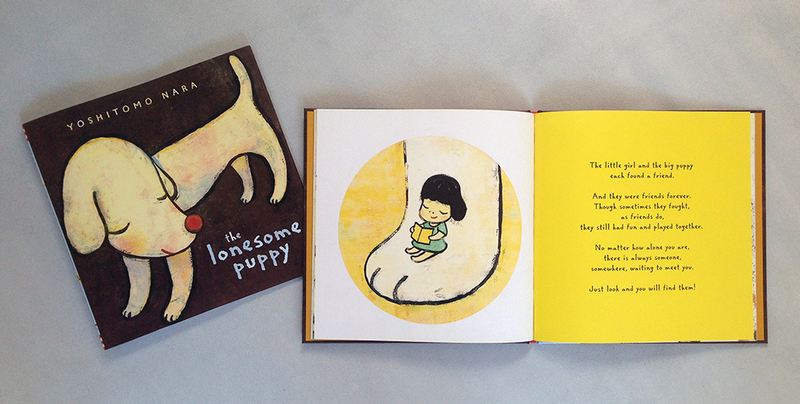 Yuko has a preview of the book on her blog here, along with an inside look at her creative process. All images courtesy and copyright Yuko Shimizu. 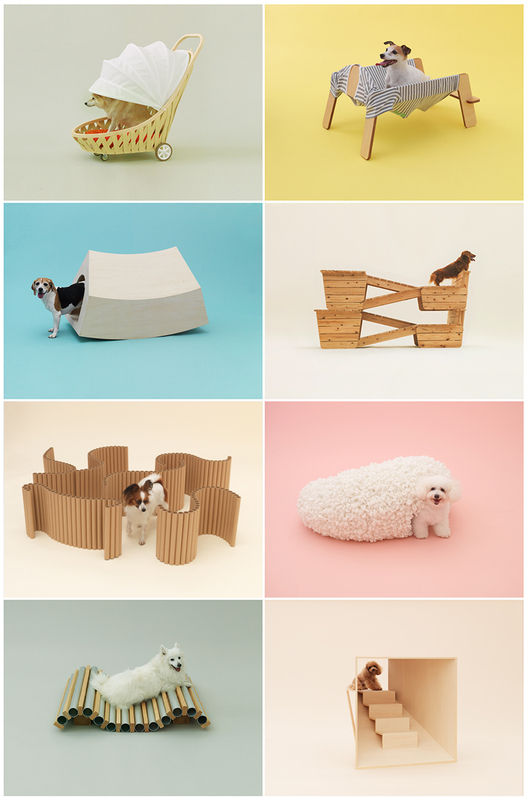 Architecture for Dogs is a very cool collection of structures designed by some incredible architects and designers. Not necessarily houses, these projects for dogs examine other variables and dilemmas. Within each project description you’ll read about design considerations that are normally never addressed, such as the goal of equalizing scale so that a small dog can be on par with its people. Or incorporating the use of your clothes so that your dog can feel comforted when you’re not around, aw. Or building with aluminum tubes to help cool down an otherwise too-hot pal. And the best part: the blueprints for all 13 projects are available to download for FREE and you can build any of them yourself! What’s better than that? The Architecture for Dogs website is very entertaining, dogs walking through and interacting with the various structures. Each project includes a description by its designer, info on the designer, a difficulty rating and estimate of time to complete, and also a helpful diagram animation of putting it together. Even if you don’t see yourself as the DIY type, it’s worth taking a look at all of the various approaches and thought processes involved. You might even be inspired to dream up something yourself. 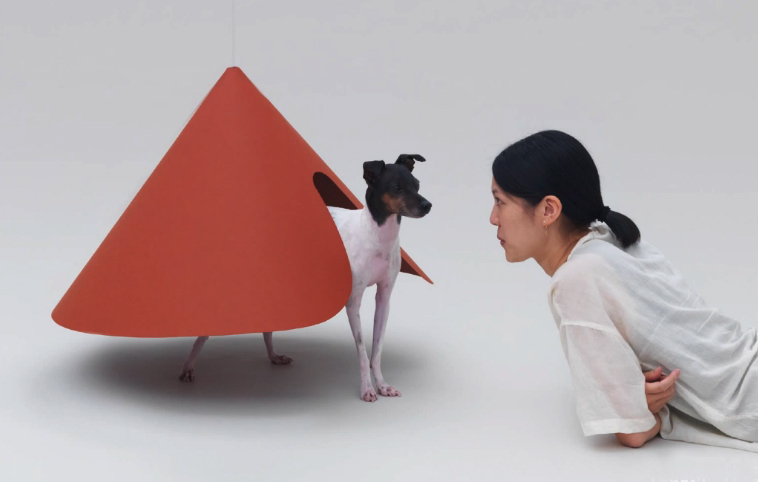 Visit Architecture for Dogs here. And turn up the volume! 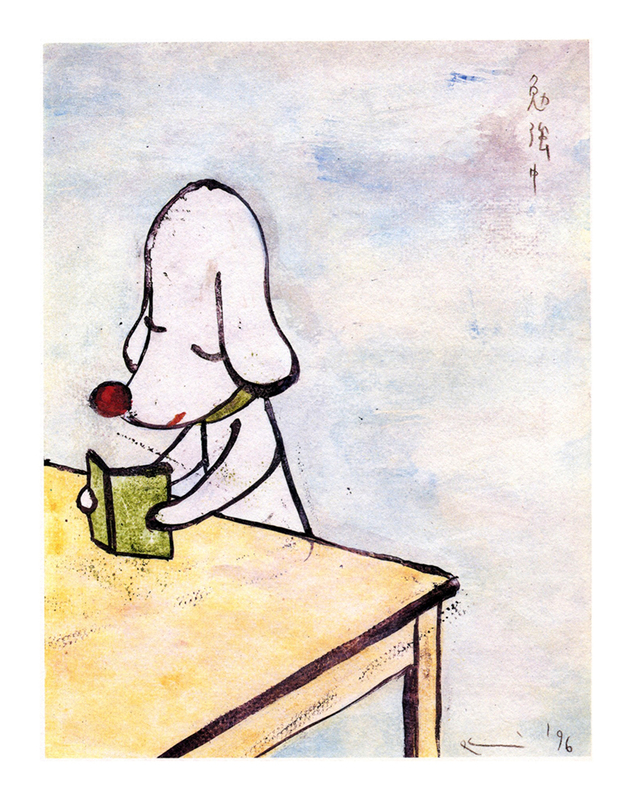 A while back I became a fan of Japanese artist Yoshitomo Nara, and what initially caught my eye of course was this white dog. He appears in paintings, drawings, and installations. At some point, somewhere (Toronto? London? Chicago? San Francisco? I can’t remember!) 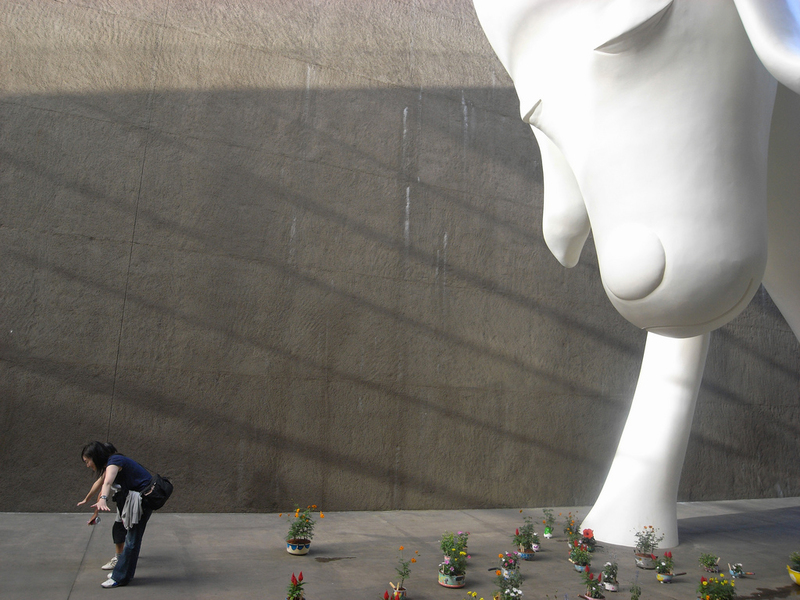 I saw an installation of three of these white dogs in a circle, bigger than life, filling up a room. I was smitten. But look at this guy! I hope I can visit Japan one day and see him in person at the Aomori Museum of Art. Just look how happy these people are! And who wouldn’t be? There’s something so great about the incredible sense of scale with any piece of that size, and it would be even better if that piece is a gigantic dog! 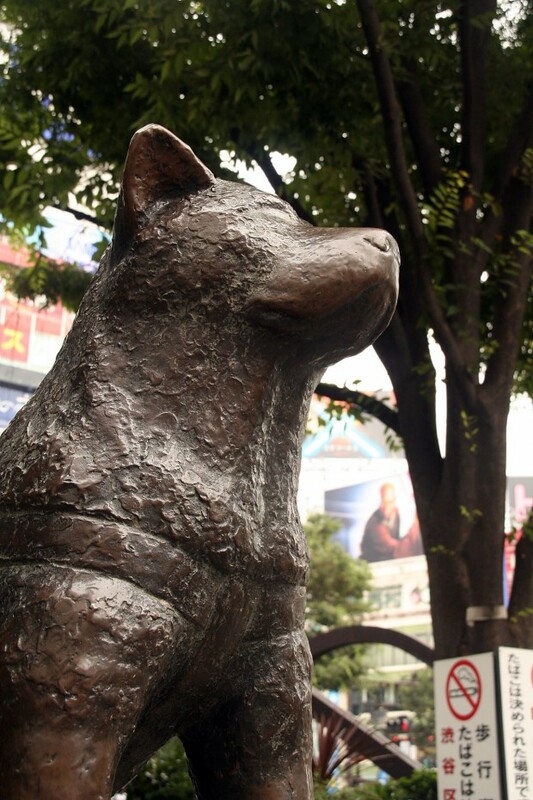 Yoshitomo Nara has also created a sweet children’s book for Chronicle with this giant white dog at the center of the story, The Lonesome Puppy. It’s about a dog that’s just so darn big, no one notices him except for one special little girl. Aw. 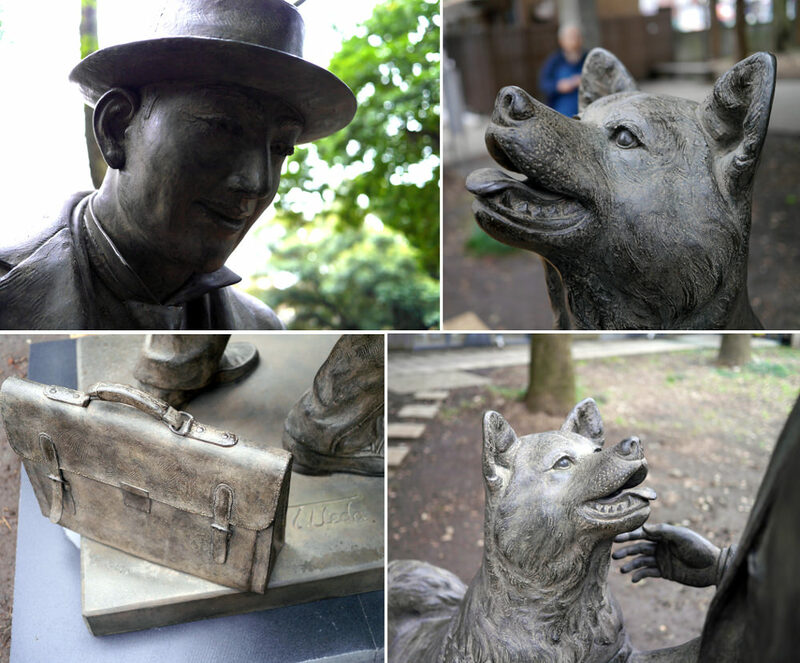 To be fair, Yoshitomo Nara isn’t entirely about white dogs. 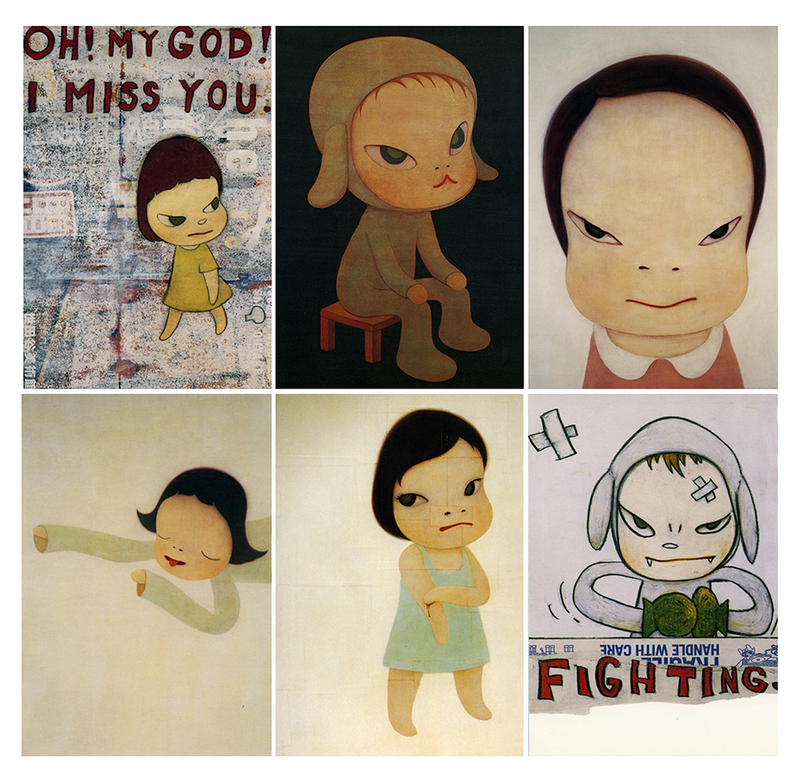 A lot of his work features these little mischievous kids, they’re trouble but they’re very alluring. And who knows what they’re up to! Smoking cigarettes, fighting, swearing a little and glaring a lot. I like these kids, but they’re somewhat intimidating and make me uneasy, like the kid that stares at you on a subway and has the power to make you squirm. 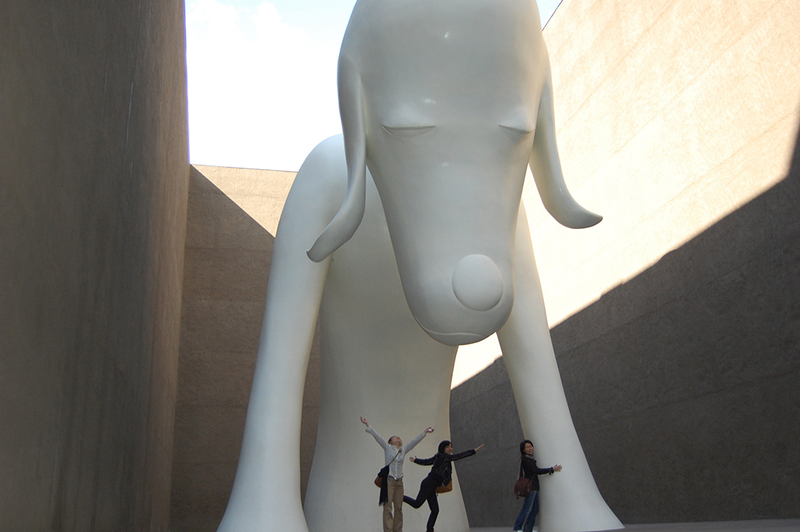 Oh save me, giant white dog! Great article on artist Yoshitomo Nara here. 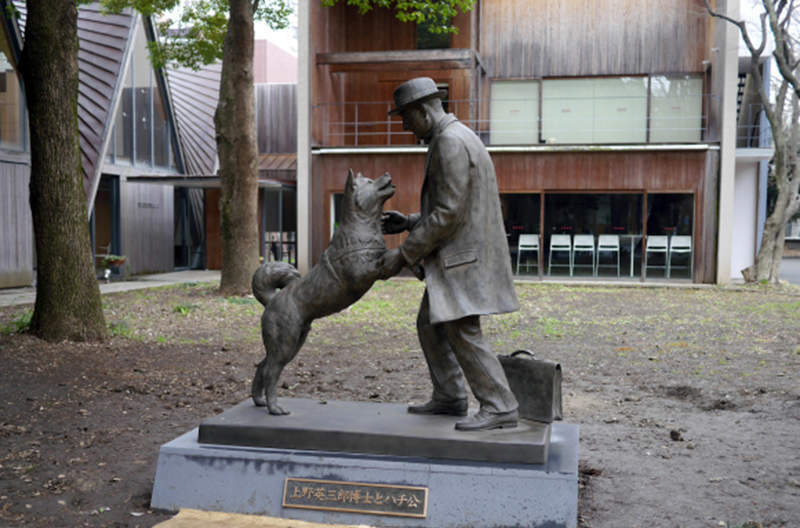 For some info on the Aomori Museum of Art, their website is here and there’s a good writeup here. Aomori installation photos from flickr, here and here.